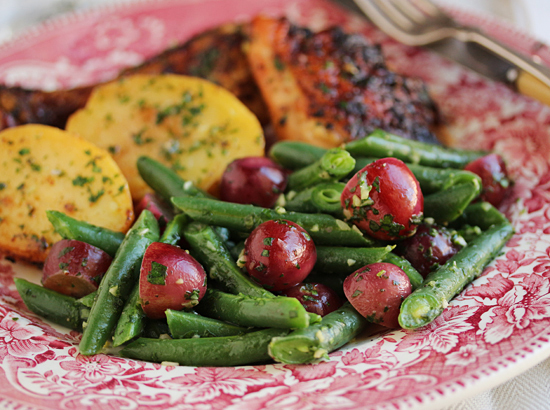 Green beans and red grapes. The colors of our winter holidays. The jeweled tones of rubies and emeralds on your Thanksgiving table. Ho ho ho. 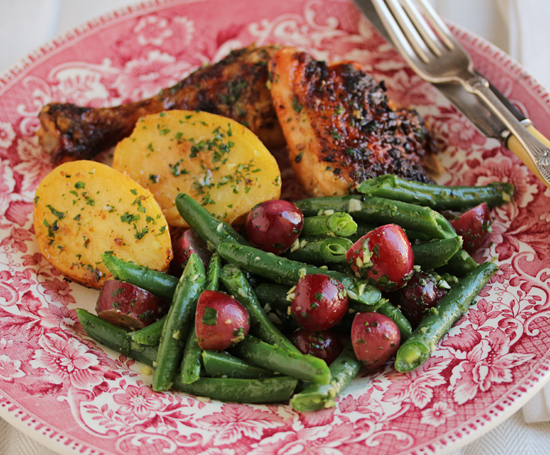 And how do those sweet grapes fit in with the totally savory green beans? You would be astounded how well. What you can’t see is the butter, garlic, minced tarragon and parsley that are on those warm grapes, to say nothing of the salt and black pepper. You’re shaking your head, right? You must trust me on this. It is amazing. Persillade is parsley and garlic minced together. Slice the garlic very thin and mince it together with the parsley. This way the oils and juice from the garlic are captured by the parsley, instead of being left behind on the cutting board. Oh, and by the way, if you were to add lemon zest, you would call your mixture gremolata. The green beans in this recipe are blanched for about 4 minutes, just until they’re not raw, then run under cold water to stop the cooking. They are tossed in a pan with melted butter, the grape halves, minced tarragon and the persillade until hot, sprinkled with a little salt and a good dose of ground black pepper. Voila! That’s it. Done. Serve. 1. 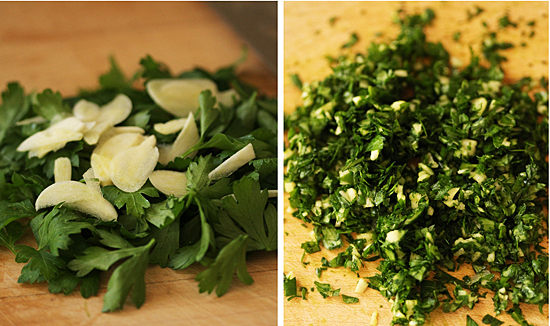 Make persillade: Mix the parsley leaves and garlic slices together on cutting board. Mince together until there are 2 tablespoons of minced parsley. Reserve in bowl covered with plastic wrap. 2. Wash green beans, trim ends and cut on steep diagonal into 2 to 3-inch pieces. 3. Blanch beans in boiling water until tender, about 4 or 5 minutes. Drain in colander and refresh under cold water. Dry in paper towel. 4. 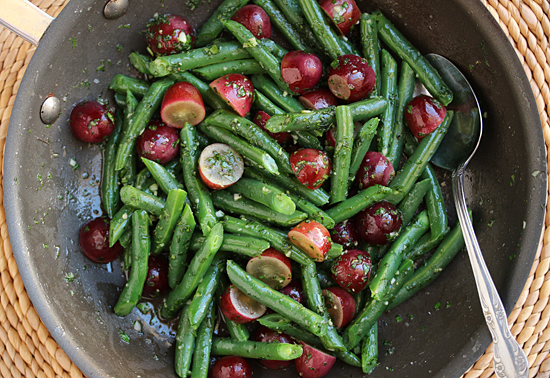 Melt butter in large sauté pan, add green beans and toss to coat. Add red grape halves, persillade and minced tarragon and toss to coat well. Make sure the grape halves are heated through before serving. Season with a sprinkle of salt and a good grind of black pepper. 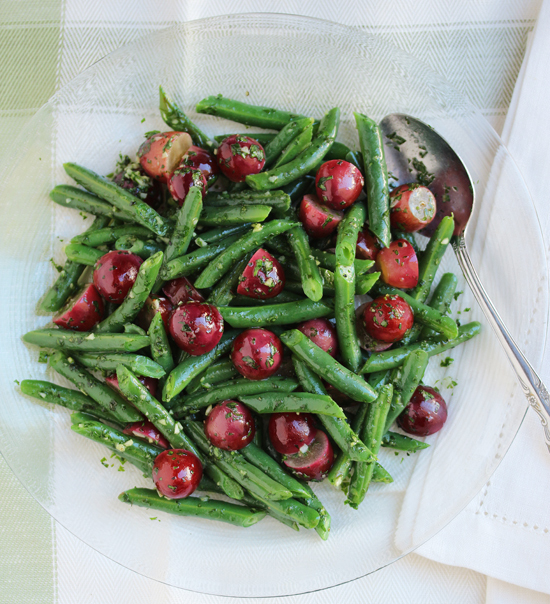 Green beans and grapes… who knew? This is one intriguing recipe that I must check out for myself. It is so beautiful! First off, this is really beautiful, and I can just imagine the warmed grapes and cooked beans with all the parsley, garlic and tarragon. I particularly like your addition of tarragon , poor underappreciated tarragon! I bet this is delicious – what a nice wintry side. Brava! Persillade on fries is very francais! This is lovely. The grapes are so interesting. Great side dish idea. Thanks, Lynne! Another one of your fancy French words? I don’t need no educatin’! I love the simplicity of this. I might even be able to tackle this one. Thoroughly enjoyed your site. “Persillade” is what brought me here, looking around to see how many different ways. Your explanation of reason behind garlic and parsley together, was, interesting. I have, for many years now, made a pork roast in persillade either on the grill or in the oven. Primarily garlic and parsley, I also incorporate breadcrumbs, butter, evoo and more herbage as well. Pressed onto the roast, usually browning, almost burning (you want this) while roasting. The next day, something very special happens, the (leftover) pork is sliced thin and gently reheated, mayo added to the persillade, then served as a sandwich or over crusty bread. Try it, you love it!